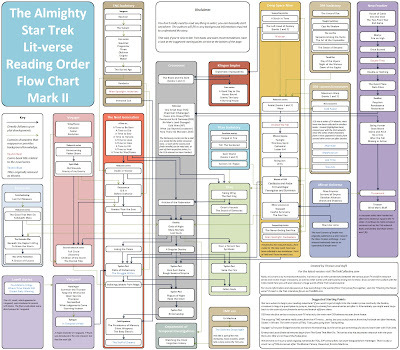 The Trek Collective: The Almighty Star Trek Lit-verse Reading Order Flow Chart, Mark II! The Almighty Star Trek Lit-verse Reading Order Flow Chart, Mark II! About a year ago TrekBBS user Thrawn created The Almighty Star Trek Lit-verse Reading Order Flow Chart, and graciously allowed me to post it on this blog - I felt it was such a useful resource that I made it a permanent feature linked to at the top of the page. A year of books later it was time for an update, so I've been working with Thrawn to redesign and expand to the flow chart to both include the latest and forthcoming releases, and work in a little of the wider lit-verse; adding in more of the older books that directly feed in to the current series, and managing to squeeze New Frontier on as well. So here is The Almighty Star Trek Lit-verse Reading Order Flow Chart, Mark II. You can find the full sized version permanently available on the reading order page. Thanks once again to Thrawn for allowing me to host his work, and expand on it, and for his assistance with the latest additions. This is awesome. I love charts like this, thanks for making it. It's nice to see the connections, though in a way this charts just proves to me there's no way to read all these books in any sort of linear way, which is okay. Well there is one linear way: Publication order. Which is mostly the best way too; as references to events from future novels (where ever they sit in-universe) wont spoil anything, and having read everything before you'll understand all references (that you remember) to past works.